Rifts Develop In Egypt's Muslim Brotherhood With the common enemy of Hosni Mubarak gone, the brotherhood faces internal divisions over its future direction. It could be vague on political positions in the past, but "now it's got to make hard choices," one analyst says. Egyptian Muslim Brotherhood Shura council members gather outside the new Muslim Brotherhood headquarters in Cairo on April 30. In Egypt, the once-banned Muslim Brotherhood is now the most organized political force in the country. It is poised to capture a significant amount of power in nationwide elections being planned for the fall. But dissension in the brotherhood's ranks has been growing since the ouster of Hosni Mubarak. Key figures in the group are bolting, and at least one has been expelled, causing some in Egypt to question whether the decades-old movement can survive. The Muslim Brotherhood joined forces with young Egyptians who rose against Mubarak and his government earlier this year. One of the group's leaders who joined protesters in the streets was Dr. Abdel Moneim Aboul Fotouh. "It is a miserable thing that [a] regime refuse any political reform," Fotouh says. Mounting public pressure for change forced Mubarak to resign. But when Aboul Fotouh more recently pushed for reforms within his own organization, the brotherhood gave him the boot. Fotouh abruptly canceled an interview with NPR in which he had agreed to talk about what happened. Another popular brotherhood leader, Khaled Dawoud, is also in danger of being axed. He warns that getting rid of figures like Aboul Fotouh does not bode well for Egypt's oldest opposition group. Dawoud is one of many key members who were recruited from Egyptian university campuses in the 1970s to help revive the brotherhood while the group's leaders were in prison. He argues that the brotherhood should offer moral support and Islamic guidance to its members, rather than political mandates. He believes members should be free in the new Egypt to join whatever political party they want. So Dawoud created his own center-left party called Riyada, or "Pioneer." Other dissidents have formed three additional parties in recent weeks. The brotherhood views the actions as a betrayal and is fighting back. Spokesman Mohammed Ghozlan says members joining anything other than the brotherhood-sanctioned Freedom and Justice Party face expulsion. He argues members can't be all over the political spectrum and at the same time claim to adhere to the brotherhood's conservative Islamic values, nor can they run for president as Aboul Fotouh is doing, and which is the official reason given for his expulsion. As long as it operated kind of under the radar, [and] as long as it was not completely legal, it could in a sense be all things to all of its members. Nathan Brown, a professor of political science and international affairs at George Washington University. Analysts say the group enjoyed far more unity and loyalty when it faced a common enemy: Hosni Mubarak. 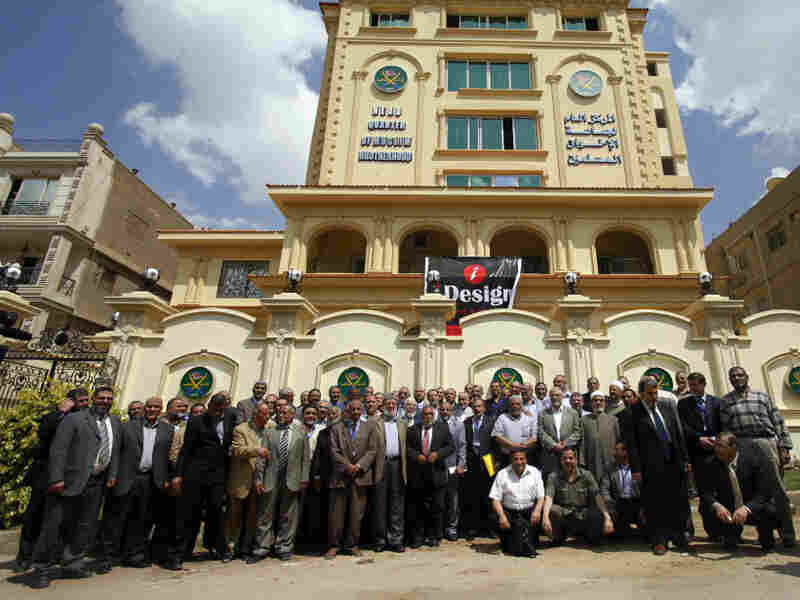 He and his government accused the group of treason and terrorism and aggressively pursued brotherhood members. That forced the group to operate secretly in small cells, with power concentrated in the hands of only a few members. "As long as it operated kind of under the radar, [and] as long as it was not completely legal, it could in a sense be all things to all of its members," says Nathan Brown, a professor of political science and international affairs at George Washington University. "It could be a social group; it could engage in charitable activity," Brown says. "It could enunciate public positions that were a little bit vague that could be interpreted different ways by different members, and now it's got to make hard choices." Brown says the brotherhood is struggling to adjust to an Egypt where it can operate more openly than ever before. "And that's just historically not the way they've operated, so it's a real cultural shift for the leadership and one they are making with some difficulty," he says. But neither Brown nor Tarek Masoud, a Middle East expert from Harvard University's Kennedy School, believes the dissension spells the end of the brotherhood. Masoud says the group weathered similar rifts in the past. "From the standpoint of the Muslim Brotherhood, I'm not sure that this distresses them. They've never wanted or aimed to be a mass organization that encompasses a huge percentage of the Egyptian population," Masoud says. Analysts say that without its liberal leaders, the brotherhood could be more inclined to forge alliances with other Islamist movements that are emerging on Egypt's political scene. For now, the brotherhood retains the upper hand politically over its dissenters. Only the group's Freedom and Justice Party is authorized to run in parliamentary elections being planned for September.